Juwel Aquarium BioPlus Course Filter is primarily used for the mechanical and biological filtering of your aquarium, making it an essential component of the Juwel Filtering System. Made with a course pore structure to give it a large surface area, the filter will guarantee relatively high and even water flow velocity. This means that is particularly suited to biological filtering in the aerobic area. 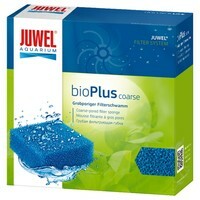 The Juwel Aquarium BioPlus Filters have been made without the use of chemicals, which means there is no residue left behind.